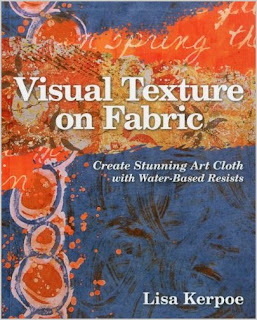 Lisa Kerpoe's new book, Visual Texture on Fabric, is very specific in its scope: Lisa focuses on using water-based resists to create layers of color. What I like the most is that she uses easy to come by resists like flour, oatmeal, soy wax, and acrylic medium. Just about everyone has one or more of those things hanging around. Well, I don't have soy wax, but I certainly have all the rest! Lisa explains the ways to apply the resists to gain you maximum visual texture when you then apply your colorants. She prefers fiber reactive dyes to paints, although she does explain how to thicken dyes so that you can "paint" with them. That threw me a bit, since I am a paint person. 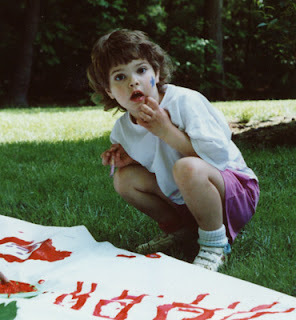 But I figured that I could simply thin my paints so that I could "dye" with them! The book has several very handy features. Lisa covers how to layer the techniques for maximum visual texture. She includes a troubleshooting guide chart for when things don't go exactly according to plan. And she also has charts to help you remember which application techniques work best with each resist. The layouts, photos, and illustrations throughout the entire book are up to the high standards you expect from C&T Publishing. I've been interested in learning more about soy wax, so I spent quite a bit of time on that section. Overall, as I said, the focus of this book is narrow, but if you've been interested in this way of working, I think you'll find it to be a wonderfully complete guide. This book is now on my wishlists! You have an uncanny ability to know which books I need to buy next, lol! Seriously, a book that has all these kitchen recipes in the one spot is a handy thing to have! Roll on the holiday season! I was sooooo happy when they sent me this book to review! It sounds like a very well thought-out book. I love charts and other handy references that like. They save so much time in both planning and troubleshooting. Thanks, Cyndi, for letting us know!